Joshua Brickel says: "The person is more important than the place. I moved to St. Louis because of Amy, not because of St. Louis." In 2006, Joshua Brickel was 39, single and living in Israel, in Jerusalem. His neighborhood was one favored by the city's Modern Orthodox, English-speaking singles. The residents called it "The Swamp," because the coziness of the scene makes it difficult to leave. years after receiving my master's degree from Columbia University in 1990. "My first marriage ended after 18 months, and there were no children. And when I looked to remarry, I did not limit my options. I was open," says Joshua. Things were quite different for Amy Boniuk. In 2006, she was a divorced mom living in St. Louis with a 10-year-old daughter. "My challenge," she says, "was to find someone who was willing to live in St. Louis temporarily. Though I eventually want to live in Israel, custody issues preclude that at this time." Both Joshua and Amy registered at the website of SawYouAtSinai.com. Joshua was signing on from his home in Jerusalem, and Amy from her home in St. Louis. "This is a unique program," says Marc Goldmann, the site's founder. "Unlike other sites, SawYouAtSinai.com combines the human element of a hands-on matchmaker with the convenience of the Internet." Both Joshua and Amy were lucky to connect with Channi Fischbein, a matchmaker with keen insight. Channi recalls that when Amy became a member, she made a point of calling the single mom to get to know her personally, not relying solely on the information Amy had provided in her profile. "When we spoke about her preferences, one thing was clear; Amy felt that she had the most in common with men who had moved to Israel." The matchmaker recalls that before she herself married and became a matchmaker, she was half of a long-distance match - "I'm originally from Europe, and my husband is from the U.S. - I am the first one to convince people that long-distance matches DO work." Some say that matchmaking is both an art and a science. Channi says: "When I was searching through my files, something struck me about the profile of Joshua Brickel. There were specific points he mentioned in his profile that immediately made me think about Amy. Both of them having worked on themselves to become what they are today on the religious level, gave them a sincerity and a will to do the right thing, not because they had to, but because they want to, because of the honesty within them. They were both aspiring for more. Their love for Israel was apparent. What stood out most was a warm-hearted and affectionate personality, showing genuine gestures of kindness." For Channi, the signals were clear: "Then and there, I decided to give it a shot, and I prepared to go to work on convincing each party on the merits of the match. Somehow, both Joshua and Amy agreed with me, and not long after that, they had their first phone conversation." Joshua picks up the story: "Channi was right on target when she sensed the warmth. From the very beginning, Amy and I hit it off on the phone. The next step was for us to meet. Amy has a sister who lives in Israel, and Amy came to Israel over Thanksgiving week, 2006. " Such meetings, with built-up expectations, can of course be a bust. Rosie Einhorn. and Sherry Zimmerman, who write an advice column for aish.com, warn: "Long-distance dating can get sticky. Often, you've invested so much time, effort and money into arrangements to meet, that you literally overdose on each other when you do get together. Everyone needs time between dates to let their emotional and intellectual processes work themselves through. Long-distance daters have to learn to juggle their desire to maximize their short time together with their need for personal space. Years of experience has taught us that people who try to spend most of their waking minutes together often end up tense, unsettled and unhappy." But Amy and Joshua ended their week in the same city in wonderful spirits and were ready to take their relationship to the next level. "I now wanted Joshua to come to St. Louis to meet my daughter, Hadassah," says Amy. "It was a crucial step." Joshua came to St. Louis in February, 2007. "Within a short time," says Amy, "Joshua and Hadassah developed a very comfortable relationship. Joshua was wonderful about moving to St. Louis." "I miss Jerusalem, but the St. Louis Jewish community has been very welcoming," says Joshua. At the website of SawYouAtSinai, the wedding of Amy and Joshua is noted as simcha #191. 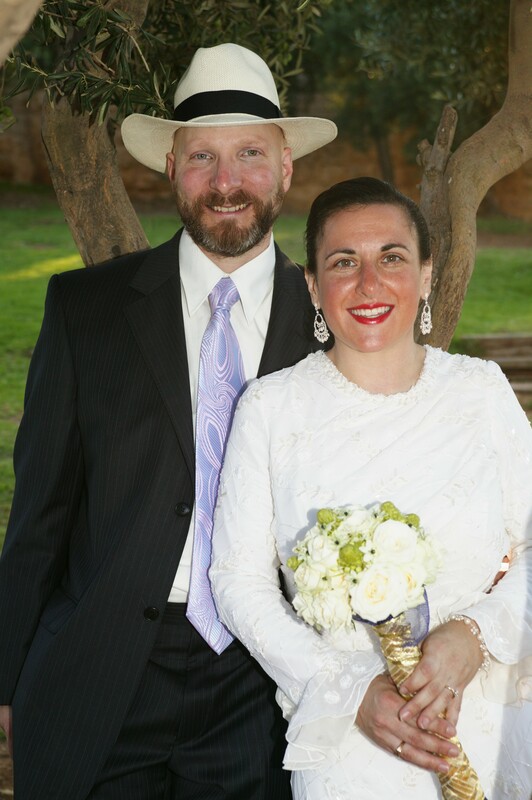 Amy and Joshua were married in Jerusalem on August 15, 2007. Mazal tov! © 2000 - 2008 The Jewish Week, Inc. All rights reserved. Please refer to the ights reserved. Please refer to the legal notice for other important information.